The reason is that, eventually, all hard drives will fail, and it may have NOTHING to do with how NEW the drive is. New drives can and DO FAIL all of the time. 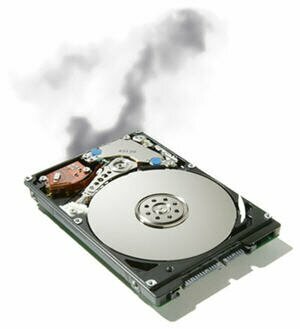 Our blog post recently about two fairly new Seagate Enterprise level (high quality) hard drives failing is case in point. What this post is about is how well the Netgear ReadyNAS (in this case an Ultra 2 Plus, but all current models behave well this way) allows you to replace a failed hard drive without hassle or losing any data. It’s pretty easy to identify which drive is failed in a Netgear ReadyNAS and all of the hard drives in current units are hot swappable. If you do not have a backup of critical data, backup first! We covered the actual steps in previous posts, and it is simple. The thing we want to show here are screenshots of the messages the ReadyNAS will give you to let you know what’s going on. RAID Sync Started - A Good Sign! You can see in the background of this image it is still showing Disk 1 to be “dead”. A “refresh” of the page would show differently. The RAID sync will start on its own, once you insert the new disk and it spins up. Whew! - A Sigh of Relief! This is the message we love to see. RAID sync finished; before another drive fails. It’s not often they fail at the same time, but if you either did not notice the first drive failed and/or did not have email alerts set up, you CAN lose another hard drive before getting the first failed drive replaced and resynchronized. If you have email alerts set up, all of this notices will come to you via email as well. Remember, when buying hard drives for any NAS unit, always choose from the manufacturers hardware compatibility list. When you do have a hard drive failure in an Netgear ReadyNAS or other NAS device, always follow through until the end to make sure your RAID storage is fully re-synchronized and actively protecting your data. When a hard drive fails it usually means data loss (since last backup, anyway), UNLESS you have properly configured redundant hard drives. With a Netgear ReadyNAS server, X-RAID or X-RAID2 is the easy choice to provide data redundancy. 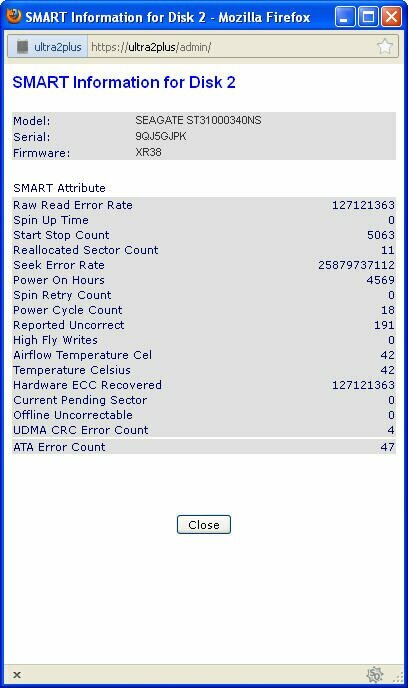 When the hard drive failed in our ReadyNAS Ultra 2 Plus we lost no data because X-RAID2 was providing mirrored redundancy to the 2nd drive in the unit. How Do You Know A Hard Drive Has Died? Normally we configure the ReadyNAS units to email us with any alert information we need to know; and we did with this unit as well. Unfortunately, we did not test the emails after moving the ReadyNAS Ultra 2 Pluse to a new location with a different ISP that apparently was blocking outbound server emails (port 25 SMTP traffic). However, if you have the ReadyNAS Ultra 2 Plus in a visible area, the unit also alerts you via LED’s on the front of the unit. This video shows how the LED’s let you know that a hard drive has failed in the unit. As you can see, the unit will tell you, you just have to pay attention! ReadyNAS Ultra With 1 Hard Disk or 2? We know that many providers of 2 drive network storage devices will sell and support the unit with only 1 hard drive. To us, this is short sighted. The only real justification for that is if the NAS performs ONLY the job of backing up other data. But even then, if that is your only backup, and your sole hard drive dies, now you have NO BACKUPS! How long is it before you replace that drive, either restore the configuration (if you had it backed up) or re-configure it and perform all of your backups? Naturally any historical backups would be gone. Therefore, 2 drives in your NAS, configured in X-RAID (for ReadyNAS or normal RAID1 in another NAS product), and you won’t lose any data if you jump right in after a drive failure and get that drive replaced. Unfortunately, there is a lag time especially if you have to ship in an under warranty drive to the warranty center and wait for a replacement. Since one new hard drive died, it made sense to check the health of the other drive. Fortunately it’s easy to check the hard drive SMART status in the ReadyNAS FrontView. Wow, Not What I Want To See! Look at all of the errors! Not too many sectors reallocated, but this is simply not good. Could there be a problem with the ReadyNAS firmware? Maybe, but the drive that failed we tested on a bench PC connecting it with our Vantec USB Hard Drive Adapter and testing it with Seagate’s SeaTools. It passed the short test but miserably failed the long test. Not being under warranty, it’s going to head out to the shooting range to become a target. As a result, we are going to take the opportunity to upgrade this Ultra 2 Plus to 3TB hard drives. I have stated before that I like Enterprise class drives for my ReadyNAS servers since they not only have higher expected reliability but also come with a longer, 5 year warranty in case that expected reliability does not materialize. My ReadyNAS Ultra 2 Plus (full review here) was purchased diskless. I had two 1TB Seagate enterprise class drives on the shelf that I wanted to use before 1TB sized drives sunk out of the realm of significance. These drives were bought, apparently, online from a vendor who “had them in stock”; something that can be a challenge, unfortunately, with regard to enterprise drives – and at a good price. Turns out, they were OEM drives stripped out of a system or whatever, and devoid of the typical 5 year warranty. Good thing they were reasonably priced. Well, in under 6 months of service, one of the drives died. Now, to make things EVEN WORSE, the Smart monitoring on the Ultra 2 Plus shows the other remaining drive in the RAID 1 mirror is generating TONS of ERRORS! I highly recommend not straying from the ReadyNAS hardware compatibility list when choosing hard drives for a ReadyNAS server. Unfortunately, the list of qualifying drives – that can be found in stock – is typically a short one. This post on 3TB hard drives for ReadyNAS Ultra is still current even though some of the hard drives listed aren’t. 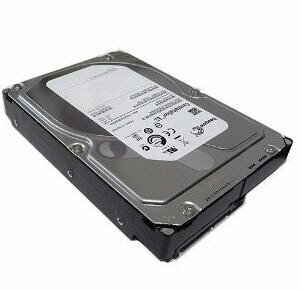 The best choice for me is the Seagate Constellation ES.2 ST33000650NS 3 TB Internal Hard Drive It’s currently in stock, and at around $310 (July 2012) it’s about as reasonable as you will find. Upgrading to the larger disk will be a piece of cake in an X-RAID configured ReadyNAS (X-RAID2 in this case). At that point I should have a RAID 1 mirror (via X-RAID) of 2 x 3TB hard disks, fresh from Seagate (pretty much) and with a full 5 year warranty. We received an inquiry from a reader regarding a Small Business NAS Recommendation. I want to move our company off of a really poorly configured server that we simply don’t use as a server anymore. I simply would like to store files using a few shares between a few computers. The one issue I have would be using the NAS in a multiple subnet network. We have 4 remote offices all using a different subnet 192.168.1.x to 192.168.5.x. Will this be a problem for a NAS as we can ping and print anywhere? What is the best poduct for our needs. Thanks in advance. If you can ping and print anywhere then the subnets is not an issue. Bandwidth, however, can be an issue if the files are very large. Without knowing anything else I can only give you general guidance on a new NAS. ReadyNAS is one of our favorites because they have good quality, good support and pricing that is not extreme (QNAP, for instance, has more features – that you probably wouldn’t use, but is much higher price), less pricey NAS units usually come with more problems. ReadyNAS have a decent warranty also. For business I like to recommend a business class product, but that does come with a higher price than just buying a consumer unit like many businesses do – and often regret later. For a 4 drive NAS that allows you RAID5 capability, the ReadyNAS Pro 4 is an excellent unit. If you want more storage, expandability, or want the dual-redundancy of RAID6 then the ReadyNAS Pro 6 would be appropriate. Note, these are desktop units, if you are looking for a rack mount style, let me know. The Pro 4 is what we ordinarily setup a small business with. You can find links to the different configurations available at our full review on the ReadyNAS Pro. Note that the Pro 4 & Pro 6 that come with hard drives in them are enterprise class hard drives with 5 year warranty and longer life expectancy which accounts for some of the higher cost than a consumer unit. You can also buy diskless and put your own disks in. There are lots of Small Business NAS devices to choose from, that is for sure. Here are some of the questions you want to ask when trying to determine which NAS would be best for your business. What services will the NAS perform (some NAS servers can run SQL, for instance)? How many concurrent users will be accessing data on the NAS? How much total storage do you need now, assuming no more than 50% utilization? How much do you expect your storage to grow over the next 3 to 5 years? What level of redundancy do you want? (RAID1, RAID5, RAID6)? If you need RAID6, for instance (X-RAID2 with dual redundancy is the terminology with ReadyNAS), then you need a 6 drive bay unit with ReadyNAS but fewer with QNAP. If you are buying disks for a diskless unit, we have various hard drive compatibility posts with links for 2TB and 3TB drives. The latest is the 2TB QNAP compatible hard drives. We are always happy to help you determine what NAS is right for you, just use our Contact page and give us as much detail as possible. 2TB hard drives for the QNAP TS-459 PRoII NAS device we mentioned we are looking at are kind of hard to find with the Thailand flooding issue (and the complete lack of supplier diversification on the part of MAJOR corporations!). 3TB hard drives are, if available, insanely priced, especially in the enterprise class category that we prefer. 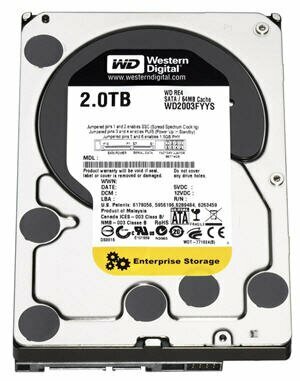 One of the highly rated, enterprise class 2TB hard drives on the QNAP compatibility list is the Western Digital 2 TB RE4 SATA 3 Gb/s 7200 RPM 64 MB Cache Bulk/OEM Enterprise Hard Drive – WD2003FYYS . Hitachi is on the list too, but when you start reading user reviews you find that many are finding DOA drives and very early drive failures. This is in line with some of our own experience as well. So to make your chore of finding 2TB hard drives for QNAP NAS devices easier we have assembled the table below with links directly to Amazon.com. Sure, there are other places that sell them, but when we check prices, shipping costs, (taxes), availability and combine that with Amazon’s great service if there is a problem, we bought ours from Amazon. We have these NAS hard drives marked as enterprise class (longer warranty, better reliability) if they are, otherwise assume consumer class (lower price). Please note that some Western Digital drives not listed here, but listed on QNAP’s site as compatible also have a “Note #9″ which states that even though compatible, Western Digital recommends NOT using them in a RAID system. Therefore we have NOT included them above. Samsung drives are not included because of personal experience and a Note at QNAP’s site about downloading a special tool to improve data integrity. Does that scare anyone else besides us? So check the list (and check it twice!) and grab yourself some 2TB hard drives for a QNAP NAS. 3TB will eventually be affordable, and prices can change daily so check first if you think that might be your preference. The QNAP 4-Bay Turbo NAS Tower Server TS-459 ProII is a premium 4 drive bay NAS that offers RAID6, and, BTW, USB 3.0 as well. These are two features that you won’t find in our otherwise favorite small business NAS, the Netgear ReadyNAS Pro 4. Granted, though, the QNAP is much more expensive. Does it do more? Yes, the feature list is quite expansive. But many of these features are not going to be important to most buyers. Yet the USB 3.0 ports in themselves are a welcome addition that we only find on the 2 drive bay ReadyNAS Pro. 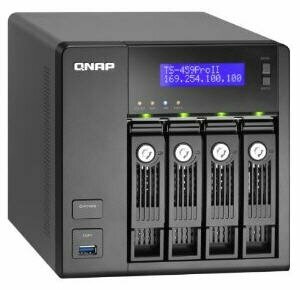 For us, though, being rather enamored by the security of RAID6 data protection, find the QNAP attractive since you can configure the 4 drives in it for RAID6. Netgear, for some reason, dose not allow this on any of their 4 drive offerings; you have to buy a 6 drive system to get it with ReadyNAS. RAID6 only requires 4 drives, so why not, Netgear? So we are looking seriously at making the QNAP 4-Bay Turbo NAS Tower Server TS-459 ProII our next NAS for in-house data storage. The QNAP come without any hard drives installed; be sure to check the compatibility list before buying. 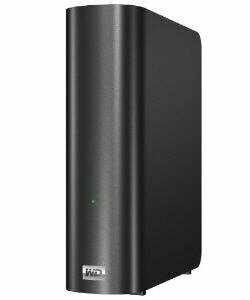 The Western Digital My Book Live Personal Cloud Storage, available in 1TB, 2TB and 3TB sizes, is one of the “cheap NAS” devices that are currently available that will probably do the job for you. Not everyone can afford or even wants to spend the money on a “real” home NAS like the ReadyNAS Ultra 2, and that’s OK. If you just need the equivalent of an external USB hard drive that is available to multiple computers and other devices, both PC and Mac (The WD My Book is Apple Time Machine compatible) then this could be for you. The key consideration is that a cheap home NAS like this should not be the ONLY copy of any data that you have unless you have a scheduled backup being performed as frequently as the data changes, hopefully daily. The problem with a home NAS like this is that it is a single hard drive, no RAID protection against a failed disk. Fortunately, the hard drives included in these Western Digital My Book network storage devices are decent quality drives in the first place and even spin at 7200rpm, so it’s not the bottom of the line drive. But that does NOT mean that it cannot fail and even fail early in life. There are lots of reviews on Amazon.com for this home network attached storage unit. And, interestingly enough, are pretty much equally split between 1 star and 5 star. What this means is that one size does not fit all; not speaking of drive size. Some buyer of a unit like this know absolutely nothing about computers or networking and that is what the product is targeted for. Yet some that have certain internet service providers may have some difficulty setting it up because of the ISP’s desire to “help” with domain name searches that fail. More experienced buyers of this product might feel a little bit restricted in what they are able to do with it. So while you will never find a cheap home NAS as our top recommendation, we nonetheless recognize the legitimate market for a product like this and admire consumers who at least are attracted to one of the top names in storage, in this case, Western Digital. Keep in mind that those who feel this device is overpriced are probably comparing it to other brands that have stuck a cheap, 5400rpm hard drive in a box and are selling it to very price conscious buyers who may end up extremely disappointed when that “cheap, cheap NAS” goes belly up with their data. Online Backup is a great way to protect yourself against data loss both from hard drive failure but also from geographic (location) disasters like flood, tornado, fire and theft. So make sure that, unless your WD My Book is FOR backup (and even then you might do well to have OFF-SITE backup) get it onto a scheduled online backup software that will support it. If you are in the market for a quality (yet cheap) home NAS then give the Western Digital My Book Live Personal Cloud Storage a look. We have used Microsoft SBS in our own small business office for over 10 years now, and overall been quite happy. Yet as our SBS 2003 box ages, I worry more and more about the dreaded Blue Screen Of Death (BSOD) which causes a piercing feeling to crash through my chest whenever it happens. Will a cold reboot fix it? Will I need to reinstall Windows? How good are my backups? What about all the little tweaks that didn’t get written down in the documentation? Will I miss any important emails while I hastily rebuild the server? I’m tired of having those kinds of worries. And while I made a lot of money as a consultant for other small businesses preventing problems like that and creating contingency plans if it did, no one pays me for working on my own stuff. I bypassed SBS 2007 and have no interest in getting up to speed with the lastest version. First, they took away all of our graphic tools saying they were a security threat and now they are moving back to them (probably because of revolt). For us it’s time to determine just how valuable it is to have our own mail server, deal with the spam and the required bandwidth versus the convenience of instant emails. And while I used to archive all emails, that takes space and time, and I almost never need to refer back to them. As for storage space, the really big stuff we are already storing on our ReadyNAS NVX. And while the NVX is not what I would buy today (I’ll get to that in a bit) it’s really nice that it just plain works. There have been only a couple of firmware updates the entire time we have owned it and any questions regarding operation are easily answered by ReadyNAS tech support or the community forum. Even adding storage to a new ReadyNAS couldn’t be easier. Whether you are adding a drive to an empty drive bay or even upgrading to larger hard drives, with ReadyNAS you do NOT need to backup all your data, wipe the RAID array clean and restore! First and foremost, we have to replace Microsoft Exchange. Fortunately we are not using SQL Server for anything or, thankfully, SharePoint. Exchange has always been nice, but in the early years recovery from a disaster was a major undertaking requiring great skill; and experience didn’t hurt either. Fortunately it is now easier to recover from an Exchange problem these days but it can still take a lot of time, especially if your database is large as most are. While I am looking at several hosted Exchange solutions I am also considering just migrating to gmail and not bothering with our custom domain. In any business with a customer presence, you want your own domain but for us it’s not that big of a deal. At one time there was some prestige involved but not anymore. Any more we forward other email accounts through gmail just to get the anti-spam services for free. Outlook is still my calendar and email client of choice, but that will work without Exchange. I have to be more diligent about backup and make sure that my online backup service will support open and locked files such as an Outlook PST file, but the best do. When it comes to shared calendar’ing, we don’t, so that is not an issue for us. Once Exchange is out of the way, the rest is easy. In the world of Windows 7 and almost every copier also being a network printer – even the relatively cheap all-in-one’s – there is no real need to run all of our printing through the server anymore. With some companies there may be permissions or special drawer usage for checks and things but not for us. Simply connect up all the printers directly via the network to each PC is fine. Windows AD is one thing that has probably spoiled me over the years. With that is the ability to run policies to control program and user behavior. What I may consider, though, is a simple Windows Server 2008 VM solely for the purpose of continuing AD as before. We’ll see. If you do not use Windows AD, just create users on the Small Business NAS using the same Windows user names and passwords as on the Windows workstations. If you don’t need password security, just open up the NAS for Guest access. Note: Don’t open up the NAS to the internet this way! File shares and permissions are what network attached storage (NAS) units do, so just create the shares you want, create the mapped drives on the Windows workstations and you are done. Just because you setup your business NAS with RAID 1, RAID 5 or RAID 6 doesn’t mean you don’t need backup. Online backup is the easiest and gets your data off site automatically. Not every online backup service will support a NAS from a workstation, though. ReadyNAS units offer scheduled backup to an attached USB hard drive for local backup and have their own online backup service named ReadyVault built-in to the ReadyNAS unit if you choose to subscribe to that. The online backup service we use with small businesses that does support network drives such as your NAS is Mozy Pro. If you do choose to dispense with AD, then your workstations need to be disjoined from the domain, and unfortunately your profiles will be trashed. That’s Windows, thanks a lot. With XP and prior you could copy profiles but good luck with Windows 7 (I never used Vista, thank God!). You can export profiles of Firefox (or sync them in current versions), copy favorites, etc and I recommend you do that. 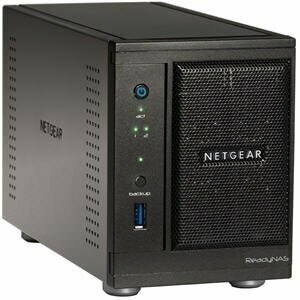 What Small Business NAS Would I Buy Today? With all of the network attached storage vendors out there you might find it difficult to settle on a vendor. 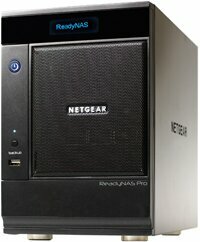 Personally, I have been happy with Netgear ReadyNAS over the years so I would stick with them. Service and support are important and the user community for ReadyNAS is the best I have seen. 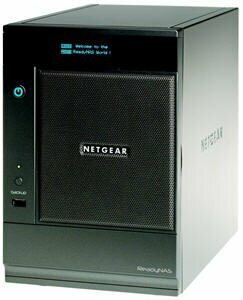 And since we would be interested in a “pedestal” (free standing desktop) unit, the Netgear ReadyNAS Pro would be the lineup that interests us. See rackmount small business NAS if you would want a NAS mounted in your equipment rack. The ReadyNAS Pro 2 is a great little unit, even has 1 USB 3.0 port, but two drives in a mirror is not quite enough for us. The ReadyNAS Pro 4 is more like it, but if we want X-RAID2 with dual redundancy (RAID 6), for some reason Netgear does not allow it except with 6 drive units and above, even though only 4 are required. So we may opt for a ReadyNAS Pro 6 just to make sure we have all the expandability we want and the option of dual redundancy. If you have a small business network you no longer need to be shackled to Microsoft. With Microsoft the cost of software is high, the cost of hardware is high, the cost of ongoing maintenance is high and when it crashes the downtime can easily exceed 24 hours. With a quality small business NAS device, the cost of hardware is reasonable, their is no cost of software, the ongoing maintenance is almost nil and the crashes almost non-existent. That’s the direction we are going. What Is The Difference Between ReadyNAS Ultra 6 And ReadyNAS Pro 6? Since so many ask what is the difference between the Netgear ReadyNAS Ultra 6 and ReadyNAS Pro 6 we thought we better address that issue before more people bought the wrong one. And just to make things interesting we will throw in the Netgear ReadyNAS Ultra 6 Plus! They look pretty much identical, all hold up to 6 hard drives and have very similar features, yet the price difference is fairly significant. In short, the ReadyNAS Ultra 6 is a premier home network attached storage device well suited to large amounts of data, multimedia storage, streaming and remote access. With 6 drive bays, you can start with RAID5 or RAID6 (X-RAID2 enhanced) and still have room for expansion. Next comes the ReadyNAS Ultra 6 Plus. The ONLY difference between the Ultra 6 and the Ultra 6 Plus is that the “Plus” is powered by a dual core CPU whereas the straight Ultra is a single core CPU. That’s it. So why would you want to pay extra for the dual core CPU? Probably if you intend on having several users accessing the NAS device simultaneously ESPECIALLY if that includes any video streaming. Video requires encoding in addition to processing lots of bytes of data from the hard drive array to the network interface so the extra CPU core is noticeable. Now let’s discuss the Netgear ReadyNAS Pro 6 and what distinguishes it from the ReadyNAS Ultra 6 and Ultra 6 Plus. The ReadyNAS Pro 6 is targeted to Small Business NAS customers, where the Ultra 6 (and Plus) are considered “Prosumer”. With Ultra’s emphasis on multimedia, this is appropriate. While the Pro 6 is capable of everything the Ultra 6 is, some of the multimedia features may not be enabled out of the box. Enabling is not difficult. Horsepower-wise, the ReadyNAS Pro 6 is powered with a dual core CPU like the Ultra 6 Plus is. This makes sense since business NAS applications are more likely to have multiple users accessing data at the same time. Looking at the above list of additional features included with the Business oriented Netgear ReadyNAS Pro 6 over the Prosumer ReadyNAS Ultra 6 and Ultra 6 Plus should make it fairly easy for you to determine if you need to choose an Ultra 6 Plus over an Ultra 6 or a Pro 6 over an Ultra 6 Plus. All three are high quality units that can give you years of satisfied service and all come with the excellent support of both Netgear and the ReadyNAS user community.